You know, it's hard to feel like blogging about the garden when it's so hot and dry that most of your outdoor time is merely running from air-conditioned house to air-conditioned car to air-conditioned office and back again. My plants are struggling to survive and some are dying, but ever the gardening optimist I continue to think about what I'll do in the garden come fall. But in August, the here and now, how about a little trip to cool Seattle for a few of my favorite things I saw or experienced at the Seattle Garden Bloggers Fling 2011? Originally I had planned to write a separate post for each day and/or garden, but I just don't think the time for that is in the cards. So I've picked out one or two things from each place to highlight. We visited both private and public gardens. At Bellevue Botanical Garden on the east side of Seattle, they have a fantastic perennial garden chocked with full-sun plants, most of which were attracting bees, butterflies and other pollinators. If the sun hadn't been so intense and my fair skin starting to sunburn, I probably would have rolled around in all those flowers! 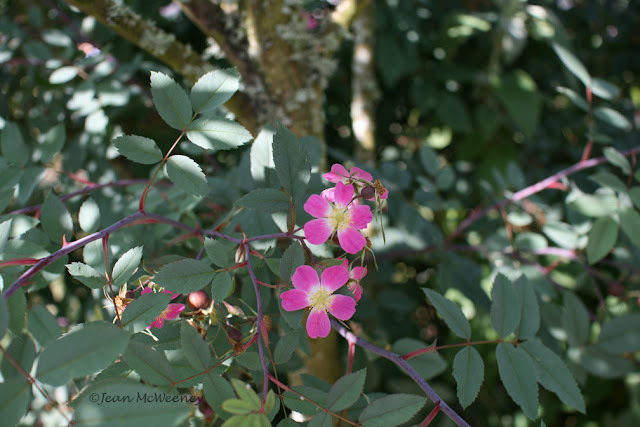 In Shelagh Tucker's marvelous garden I first spied Rosa glauca, a rose that's grown not so much for the little flowers but for the blue-gray leaves. I believe I remember Shelagh saying it can take shade. Andrea at grow where you're planted eventually got a cutting of it at Dragonfly Farms Nursery and I hope she gets it going so we can all have cuttings! 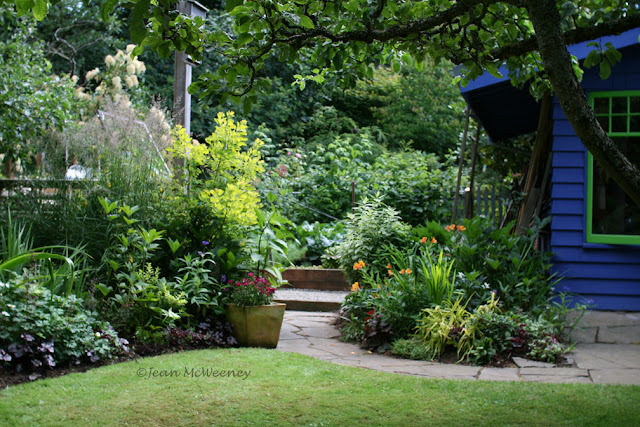 I loved seeing this open yet somewhat concealed-from-the-street sitting area in Shelagh's front yard. This area was modeled after Beth Chatto's dry garden (Ms. Chatto is a famous nursery owner and author from England). Several of the plants here were familiar from my days of gardening in Austin where drought-tolerant plants are the norm. 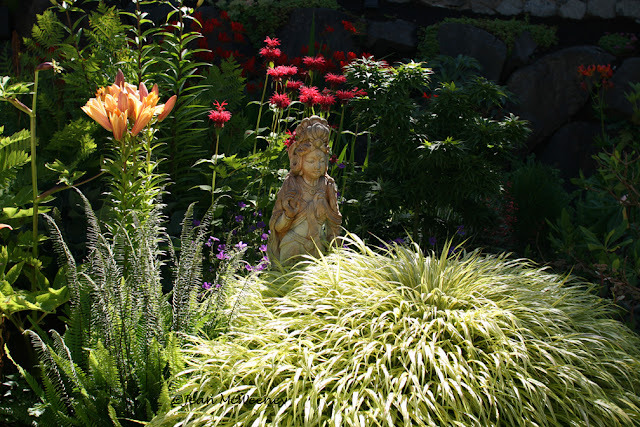 Her side yard and part of her backyard were more shady. 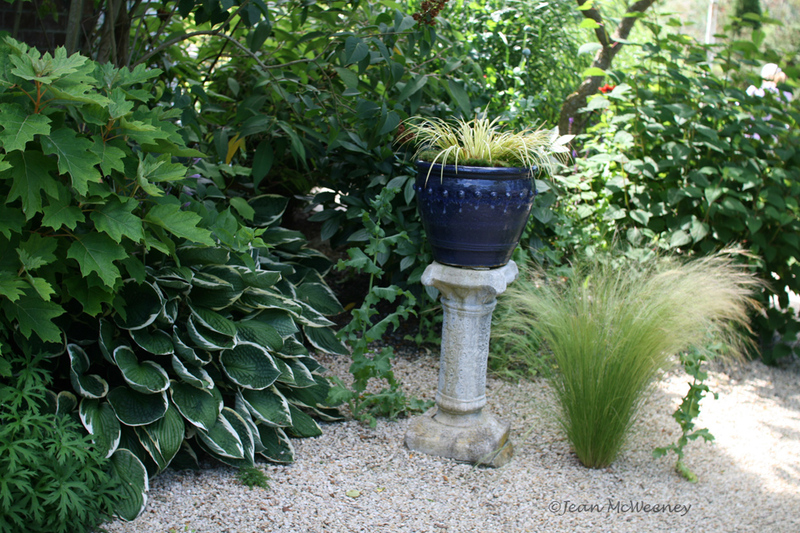 I liked this little vignette and combination of plants (hosta, oakleaf hydrangea, the odd poppy or two, Mexican feather grass). The Mexican feather grass grew so tall and with such dark seed heads that those of us from down South (mainly all the Texans and me) almost didn't recognize it. Shelagh is a master at plant combinations. This was the first helenium I saw in Seattle but certainly not the last. I may try to grow this next year. Right next door to Shelagh's house live the Birrells. Wouldn't you love to live next door to some incredibly good gardeners? I loved their ultra-comfortable backyard and their gorgeous fruit and veggie plants. Have you ever seen a more beautiful entrance to a vegetable garden? Actually, they had veggies here and there but this was the working part of the veg garden. And how about that knockout color on their workshop? It must brighten up a dreary, rainy day (I have to keep reminding myself that it rains there, although I think maybe that's a myth :-) ). 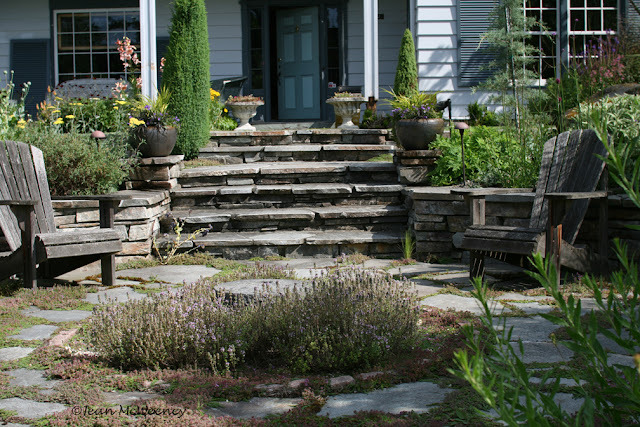 One of the things I want to do with this post is show you some things that you can apply in your own garden. I.e., it doesn't always take much money to do some clever things. 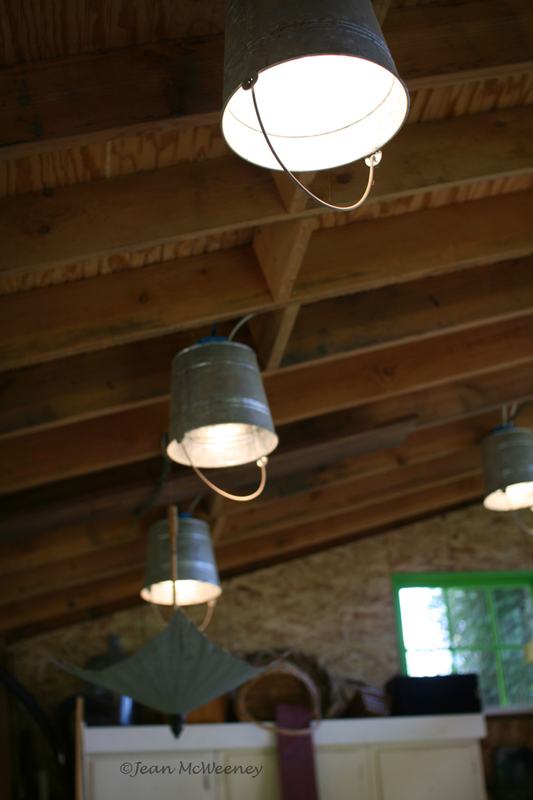 How about these bucket lights? We visited The Dunn Gardens, a historic suburban garden planned by the Olmsted Brothers in the 1910s. I highly recommend checking it out if you're in the area. Although this photo of the rock wall is not that great, I took it because I have a rock wall and I have the same kind of agaves growing in a pot. So why not move some to my wall? I thought this planted wall was just beautiful. How's this for an unusual way to hide a drain system? At least that's what I'm assuming is down there. 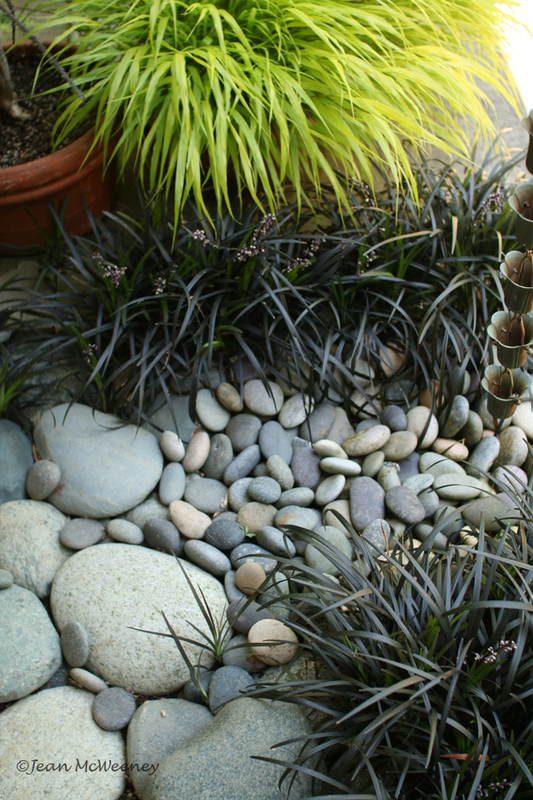 There's a rain chain to the right and these perfectly placed stones were all around the building. Nice contrasting plant colors too. The Epping garden in east Seattle had the most monstrous hakonechloa (Japanese forest grass) I've ever seen. This is one plant I lust after yet can't have. The Eppings also had a stunning view from their hilltop home. It must be a challenge to grow on such a site though. I was in awe over these tuteurs in Kate Farley's backyard. 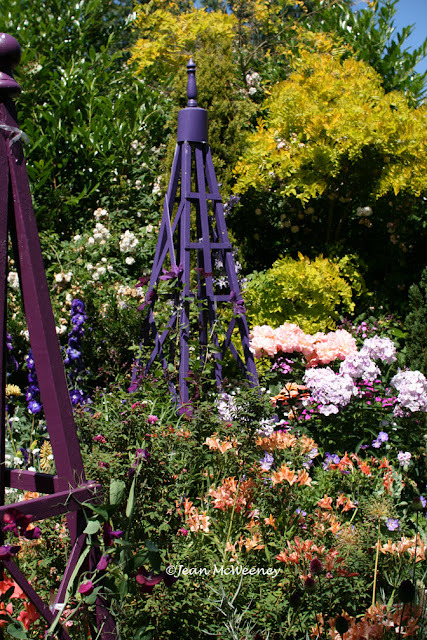 Well not just the tuteurs but the skillful way she combined their colors with alstromeria, roses, sweet peas and clematis. Oh my, you just had to be there to really experience it. Lorene, one of the hosts of our Fling, had a darling home and garden in West Seattle, and she's the author of the forthcoming Timber Press book Handmade Garden Style. 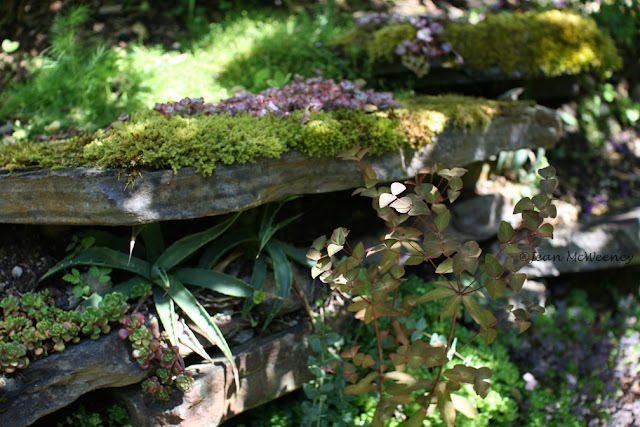 Her garden is chock full of interesting items she made herself, including this "trough" for succulents made out of a rain gutter. I think it's a brilliant idea! This outdoor terrarium made from a very large industrial light fixture blew me away. Isn't it cool? Of course, if I tried that at home it would roast the plants in no time. 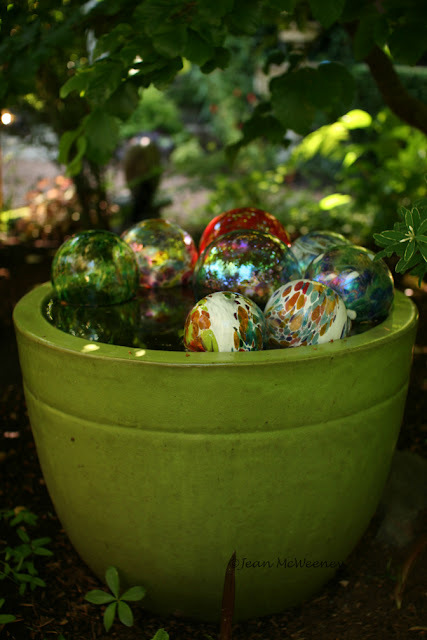 But even here it was in a little shaded nook, and I'm sure Lorene occasionally pops the top when it gets too hot. 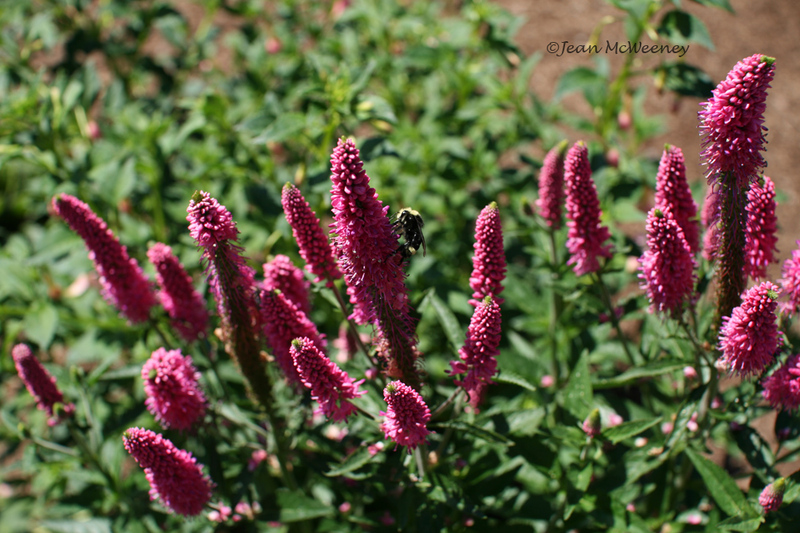 I hope you enjoyed seeing some of the neat little things, plants or objects, that I found on my garden trip. My very favorite place I toured was Bloedel Reserve on Bainbridge Island, which I posted about here. I'd like to give a big thanks to all the folks that worked so hard to make the 2011 Garden Bloggers Fling such a great success. It was fabulous; what more can I say? I like all the little details you found, some of which I missed. Especially Lorene's succulent trough along her porch rail. Great picks and pix. I didn't notice Lorene's succulent trough, so thanks for that. The ?? 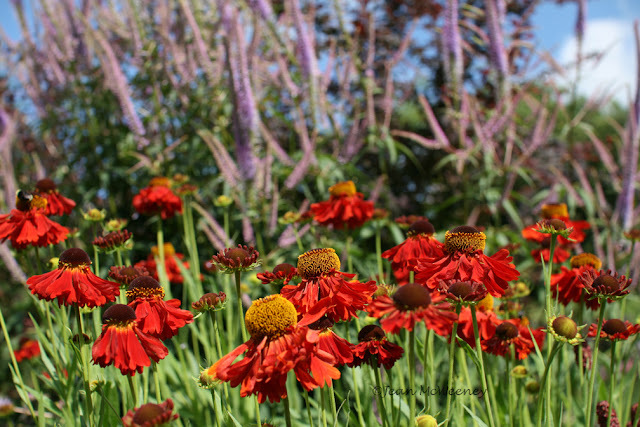 behind the Helenium is Veronicastrum or culver's root. I think it might be a variety called 'Fascination' -- the bees certainly find it fascinating. Great to spend time with you this Fling, Jean. Cheers till next time. I second Helen, that's a Veronicastrum. We did see some awfully clever ideas in Seattle. Those bucket lights made me smile. Too bad I can't have a shed. 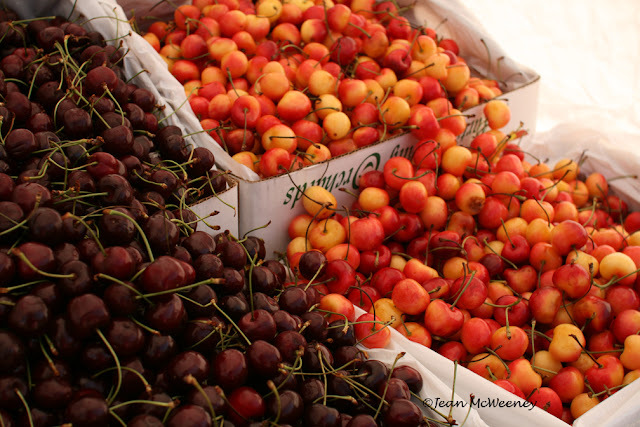 Your shot of the cherries almost brings back their taste. 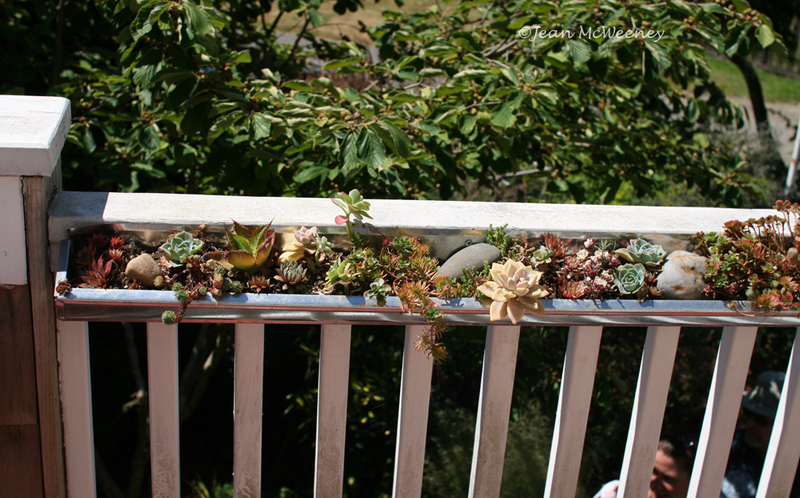 I didn't go up on Lorene's porch, so I didn't see that succulent trough. Thanks so much for showing it here. I really enjoyed this compilation of cool stuff from the Fling. I also enjoyed meeting you and sharing a vegetarian pizza with you at dinner! I'm planning to go to next year's in Asheville. Hope I see you there! 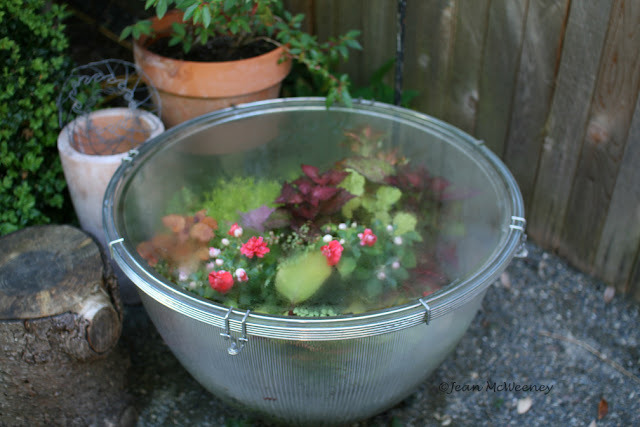 that outdoor terrarium is too cool! i don't see one surviving a north carolina summer, but it's so clever and interesting to look at in that seattle garden. enjoyed seeing your pictures of the fling. I've enjoyed reading and seeing all the sights of the Seattle Fling through everyone's posts, especially since I wasn't able to go. So interesting to see all the different perspectives and the various details each of you picked up on. One of the things I love about seeing other people's gardens is getting some new ideas. You've presented some very clever ideas here, Jean. I always think "now why didn't I think of that?" I love these photos. It's just like walking through the gardens again - but with you. You saw some things I missed. It's been fun reliving my trip to the Fling through your photos! Lovely images and some I don't recall seeing on that Fling trip. Love the drain system and if the cuttings of Rosa glauca fail, come to RI and I will give you one. I wish I could have been there. The gardens look great. So many ideas! I love the bucket lights. I've tried to grow the Japanese forest grass too and it was not happy in our garden. It was cool and wonderful, just what a tired, hot, burned out southerner needs in August. Great post. That grass like a fountain shooting out of the gravel is a wonderful idea, among many great suggestions. I just stumbled onto your blog. What a great site you have!! I am your newest follower; and I hope you will follow back! Blessings to you! !